So I've tried really hard since Iggy was born not to spam you with photos like "omg my baby is the cutest baby evarrr"
And I've limited myself pretty much to these every two month check-ins. So here's 8 months - you've been warned. Move along if you dont like baby stuff. Iggy is completely mobile and gets into EVERYTHING. For example (left to right, above): diving off of the couch into his toy bin; crawling into the actual toy bin (and smiling at me after he succeeds); climbing under the walker and almost getting stuck. Not pictured: opening cabinets, knocking the cereal boxes off of the shelf, attempting to crawl over the back of the couch onto the side table, and crawling under chairs and tables as though they're little bridges and huts just for him. 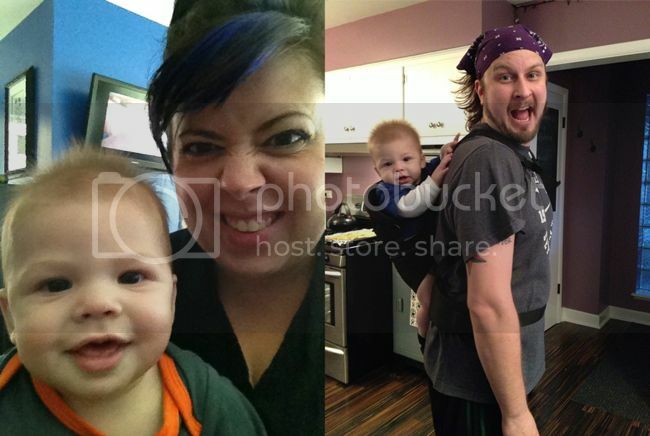 Did you see his two baby teeth in the top photos? Scroll back up and check 'em out if you didn't. My mom tells me that I didn't get my first tooth until I was a year old. But he's got two by 8 months. Yeah, I have friends with kids who have more, but this is cute, like a little jack-o-lantern. He's very seasonal and festive like that. We just got back from a mini family vacation and took Iggy with us. He slept (uh, kinda) in a pack and play from the hotel, but he's used to being in his own room, so being in the room with us when we're NOT going to sleep at 8 o'clock was difficult for him to settle down and get some rest. He was too distracted. But overall he was really good. I'll post more about that later. Iggy eats lots of things: bananas, sweet potatoes, avocados, carrots, broccoli, applesauce, and I even tried spinach and asparagus. The asparagus was a NO. The broccoli and/or spinach I have to mix with applesauce, but then he eats some. He also eats peaches and mangoes. Everything in the Baby Bullet and pureed, but he seems to like it. Oh, he also eats these Gerber baby snack things (Gerber Graduates Strawberry & Apple Puffs )... I just call them puffs. It's so cute to see him pick them up and try to get them into his mouth. They stick to his hands, face, whatever. There's still no distinct talking/words with Iggy, but he laughs a lot and makes tons of noises. He and I do a "call and response" game where he makes a noise, like "aaaaaahhhh!" and then I yell "aaaaahhhh!" back at him and we go back and forth like that for several minutes. It's fun. He also purposely blows raspberries at us, although it's not very pleasant when you're trying to feed him and he does it. He makes me laugh ALL OF THE TIME. 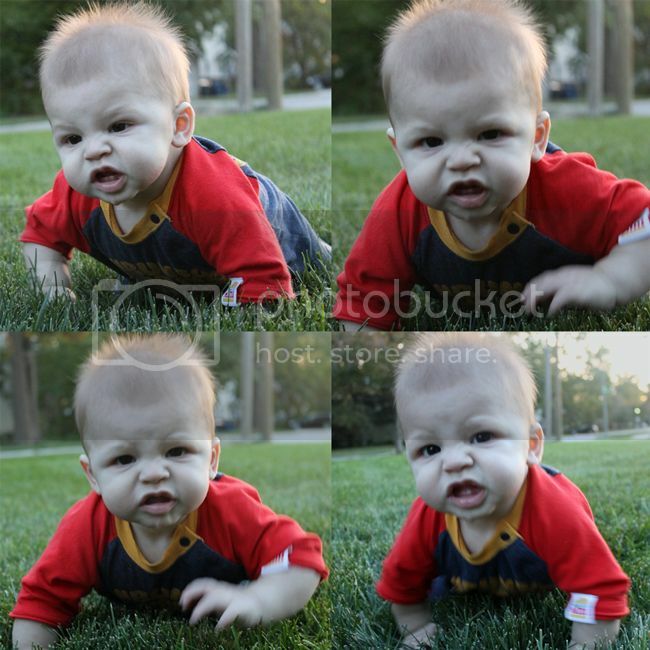 For instance, check this random angry face crawl I caught the other day in my mom's front yard. He snorts angry air out and crunches up his nose while he does this. What the heck?! But it's hilarious. Omg! He is the cutest!!! I had that harajuku mini outfit for my little man too. He used to huff and puff when he was army crawling, like a woman in labor. It was too funny! 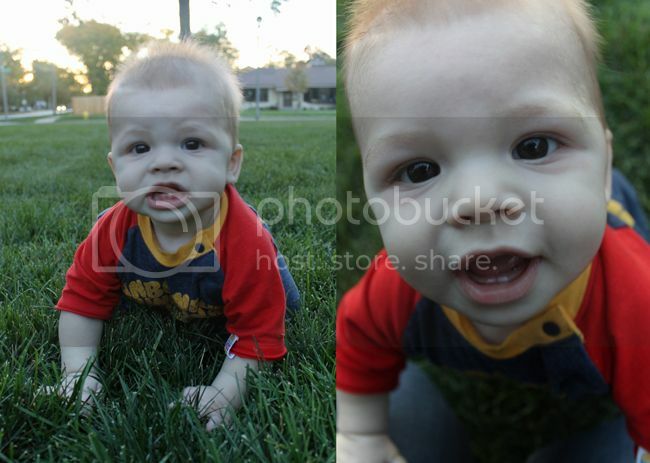 Love the update on your little man. Thanks! It's fun to read back on these and see how far he's come. And Harajuku Mini is my favorite! Ohhh he is so cute! !